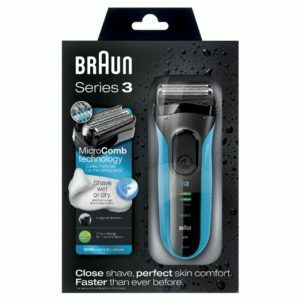 The Braun Series 3 3040 Wet and Dry Electric Foil Shaver is the latest of the Series 3 variants. It is one of the best electric shavers in the store today from Braun. When you open the box of this amazing electric shaving machine, you will immediately fall in love with its quality. The razor is clearly solidly designed, and the developers at Braun have worked so hard to keep its weight light, as well, as its design compact. There are small depressions along the side of the unit. These depressions let you put your hand into the best position to grip the razor. You can work on it whether you are left handed or right handed, a nice detail for Braun to think of in the design of the electric razor. The machine comes with a cleaning brush as well as Smart Plug, which is a power adapter and recharger and it also features a universal 100 to 240-volt rating. Although the suggested starting price for the shaver is £99.99, you can find it at half the price, or less on Amazon. One of the key complaints contained in in other reviews of the same series was that the head of the razor was very hard to use on the rough contours of the face, such as the area on the jawline and under the nose. 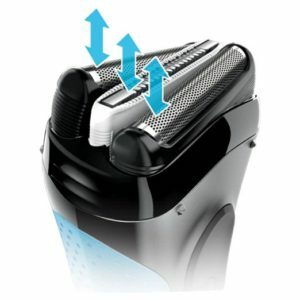 This shaver also has a new feature known as Triple Action Free Float System that treats this issue. With the machine, you can feel the razor adapting to the shape of your contours. This is because the cutting surface is categorized into three separate pieces that glide over your skin with much ease. With this machine, you don’t need to worry about tugging and pulling in areas that are difficult to shave it does its job pretty much smoothly and perfectly. It is not only straightforward, but it is also simple to use, the machine comes with a clearly written instruction guide. However, many men can use it right out of the box without going through it. Compared to the other versions of the brand, this particular shaver offers much closer results, more effective cutting both short and long hairs. The shaver was made for use in the shower, so as expected, it works when used for wet shaving. If you love to shave on a daily basis maintaining smooth skin with this electric razor will not be a problem. If you shave more sporadically, you can also get better results with the razor. However, you should expect a longer process. Studies have shown that it takes up to 15 minutes for a three-day beard, as well as various passes may be needed in parts where hair your hair is thickest, for instance, along the neck. Like many other shaver, the shaver is not only gentle to the complexion, but almost smooth. It would be a great choice for those who are more prone to razor burn as well as razor bumps, especially because you can easily use it with a favorite shaving foam or gel for an extra lubrication. We recommend this as one of the best electric razor’s on the market.